Capture what you have been missing with Xikezan Trail and Game Camera. Xikezan is a hunting camera and by so far the smallest popular animal camera in the market. It measures 5.2 x 3.5 x 2.9 inches. It is portable and multi-functional. This little camera shoots with high resolution. It produces colorful, clear, and still images during the day. At night, it produces clear black and white images. The multi-functionality of this device is purposely designed to meet the needs and satisfy the demands of each user. Xikezan is equipped with a 3-zone infrared sensor which offers this wildlife and surveillance camera a 120 degrees detection angle. Other than that, this device is also provided with exceptional speed, clear pictures, and easy programming. Before starting the operation, you can check and preview the images and videos in real time display through the built-in 2.4″ LCD screen display. With the 2.4″ LCD screen, it made very easy for the advanced users to personalize the settings and replaying both pictures and videos as well. It offers sharp and bright colorful images and videos during the day. At night, it produces clear black and white photos and videos. You can even decide whether you want the picture and videos be stamped with the date, time, temperature, moon phase, or serial number. An information strip will appear at the bottom of the images and videos once you turn the “timestamp” function on. For security and privacy purposes, the camera can be locked by a password. That way, others cannot use it, view, or delete some valued data stored in it. It also made the camera useless for those who want to steal it. To strengthen the protection, an anti-theft lock, which is not included in the package, can also be added. This digital camera can work under extreme temperatures between -20 degrees Celsius and 60 degrees Celsius. This trail and game camera features a powerful 5 megapixels CMOS sensor. This means that it can support up to 12 MP resolution in full color and 1080P HD video with clear audio recording. For both still images and videos, an adjustable resolution is also available. It has a unique sensor design that provides a 120 degrees wide detection angle. And with its 0.2-1 second trigger speed that is about the time, it takes you to blink, you surely won’t miss any precious moment. Set your camera to capture pictures or record video clips at specified time intervals regardless of whether the PIR sensor has detected motion or not. Just turn on the time-lapse function for specified time intervals and make it very useful when observing slow movements. Take photos and then record videos and then take pictures and then record videos repeatedly using the hybrid mode. With that, you can choose to take pictures and record videos alternately if you have not decided what to feature to use and if you are confused what to take. Also, this camera offers a 5 capture mode. Other modes are the photo, video, time lapse, hybrid mode, and motion detection. You can also choose to take pictures and record videos only. Xikezan needs an SD/SDHC card that is sold separately to work. The camera supports up to 32GB SDHC card that is also sold separately. You can depend on this trail gadget as your scouting materials grow and as long as your memory card is compatible with the camera. Take note that if you already have an SD card, you need to unlock the SD card before inserting it into the camera. Moreover, this trail camera offers a long-time outdoor use by using and installing an 8 AA battery. This camera can also work well with 4 AA batteries. But your decision over what batteries to use is highly dependent upon your usage. It also has a 6V power port option available for additional power. Also, with the included strap, you can fix the trail camera to a tree or a pole. Or mount into the wall, ceiling, or any surface which you can use the strap to set the device. The camera is a low glow camera. At night, it only produces a faint light. But the light is so weak that any human beings or animals can hardly notice it. It is a good thing because the wildlife would not be intruded in their habitat. You can also set the camera to turn on and off automatically at specific times. It also gives you the option of how long you want each video to record. 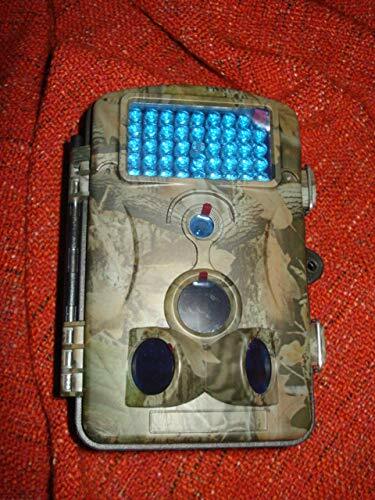 At night, through this trail camera, you can see everything that is going on in your backyards. The camera has a 12-megapixel lens and the night vision is very clear. The IR flash for night time pictures is beautiful and has no detectable effect on animals coming to a food source. This has a built-in 42 pieces IR LED. The images that will be captured and the videos that will be recorded at night rest assured clear. The unit is airtight and other than that, it has a 2.4″ screen within the sealed compartment. The LCD screen makes it very easy to scroll through the extensive but very logical menu. And that gives you the ability to customize exactly how you want to set it up. The LCD allows you to play black in the field of either videos or pictures. And, the screen might be fantastic for viewing your images through its scroll feature. Xikezan is very small, lightweight, and compact, and has a tad thinner of a feel than any other cameras. It is also reliable. The unit itself is very sturdy and is built with quality materials. One of the considered remarkable points in this camera is the battery savings. The trail camera can also be used with rechargeable batteries. With the external battery packs and solar chargers, it might be possible that you can go for months without changing the batteries out. The waterproof rating of this gadget is IP54 which means that is protected from spray water. This camera can also be considered as a security camera. One of the things that might be undesirable for you is that this trail camera does not have a loop recording function. The camera will stop working when the card is full. Also, the camera does not come with a memory chip. Its waterproof rating is IP54 meaning it’s only protected with spray water. It cannot be caught in the rain for an extended period or be soaked in the water. It also discourages its users to use it in driving rains. When setting up this camera in the woods or anywhere in your property for weeks, you may discover a camera full of moisture. The camera may remain securely closed, but upon opening the camera, the water may run out. You may not see any visible defect in the rubber seal. But it got wet/moisture inside. The memory card shows good images for a few days and then the photos got cloudy because of the moisture inside the lens. This may only imply that you cannot guarantee that the camera is suitable for any weather conditions. Another thing is that using the most aggressive video settings of this camera could exhaust an entire set of 8 AA batteries in a single 12-hour period of use. So the optional 6V connector can be handy when recording in aggressive modes. However, the camera does not come with this adapter. The batteries’ voltage is also less than 4.6V. This camera can only work with 6 Volts power source. And you could only use power bank if your power bank is 6 Volts and is about 1.5 MAH. If the batteries’ voltage is less than 4V, the camera will not be able to record video, and the camera will not be able to take daily pictures. And lastly, this trail camera does not have autofocus function. If the focus distance is less than 30 cm, the picture will be blurry. This product is highly recommended to anyone who is looking for a high quality 1080P HD trail and game camera. This is fit for a homeowner who needs to trail their activities outside their house, especially at night, and for security purposes. Those who have hobbies in trailing, hunting, and just loves photography, and video recording in the wild may find this product very useful. This is also suitable for those people who do not mind about the looping recording function of a camera. And if you don’t intend to mount this camera anywhere it could get caught in the rain for long, then this product is for you.